Why is organic better for baby? It is free of potentially harmful chemicals often found in non-organic clothing. Babies are more vulnerable as their skin is more sensitive and their bodies and brains are still developing. No, there's no commitment. You can get the next set if and when you want to. Still, we provide the option to pay for your set on a monthly basis if you prefer. Can I pick what's in the set? You can pick the type and style you prefer. We offer Classic or Playful and the pictures for each give a good indication of what you receive. We'll send an email to give you the option to see it before we ship. What brands are in the set? 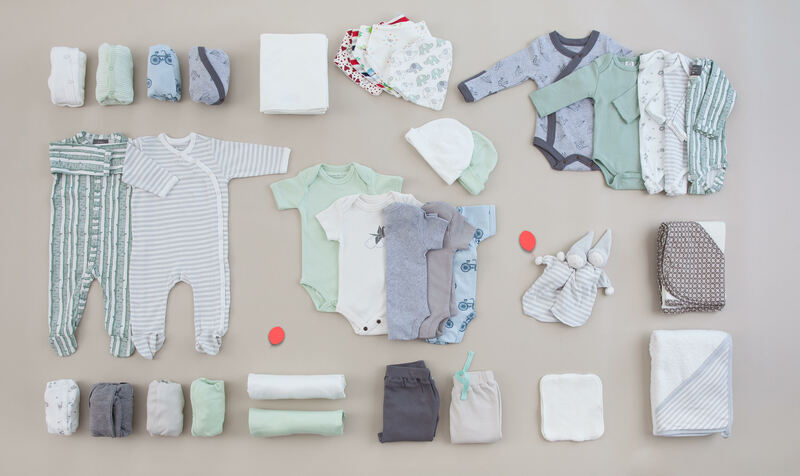 We curate adorable organic clothes from the most sustainable brands based on an in-depth assessment, including Under The Nile, Finn + Emma, Kate Quinn, Colored Organics, Burt's Bees Baby, and L'ovedbaby. How much am I saving versus retail? Depending on which set you pick, you pay 40% to 60% less than normal price for organic. Thanks to the return system, we sell clothes multiple times and lower prices for everyone. How do I return after use for credit? When your baby is ready for the next size, you can return the clothes to us and save up to 20% on the next size. Credit is given based on the number and condition of returned items.